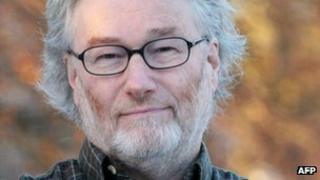 The literary world has paid tribute to Iain Banks who died on Sunday aged 59, two months after revealing he had terminal gall bladder cancer. Friend and fellow Scottish author Ian Rankin took to Twitter to toast his friend with a whisky, with others following suit. "Even the ones that didn't drink were putting a wee bottle of water or a soft drink in their pictures," he said. Another friend, crime writer Val McDermid, was one of the authors who also tweeted a toast to Iain Banks "for all the hours of delight and provoked thought". She said she was "grateful for what he left us [and] angry for what he'll miss and we'll miss". Rankin told the BBC he believed Banks's best work could still have been ahead of him. "The writing still excited him, the ideas still excited him, there was no shortage of ideas, he wasn't coming to the end of his time as a writer," he said. He told BBC Radio Scotland of his shock at how suddenly his death came. He said Banks's wife Adele had emailed friends, saying he had been told on Tuesday he had a few months left and then on Wednesday there had been "a deterioration". "There were still plenty things to be doing and he was loving what life he had left." Rankin also spoke to the Today programme about Banks's political life and how his protest against the Iraq war did not go quite as planned. "He was anti some of the stuff that Tony Blair did to such an extent that he cut up his passport and sent it to Downing Street in protest to the Iraq war - having forgotten he was supposed to be going on a tour of Australia a few weeks later," he said. Yet however heated the political debate could get, he continued, "there was always humour at the back of it and always warmth and humanity". Author Neil Gaiman said he shared debates with Banks in the bar after writer conventions. He wrote on his website of his sadness at the passing of his friend, whom he met for the first time in the 1980s. He recalled a party they both attended in 1987 in a hotel suite, at which it was discovered some jewellery had been stolen. "A few minutes after the police arrived, so did Iain, on the balcony of the Metropole Hotel: he'd been climbing the building from the outside," he said. "The police had to be persuaded that this was a respectable author who liked climbing things from the outside and not an inept cat burglar returning to the scene of his crime." Gaiman said he had written to Iain when he heard the news of his terminal cancer, telling him how much he had loved knowing him. "He wrote back and said good, comforting, sensible things. Goodbyes are few enough, and we take them where we can," he said. "If you've never read any of his books, read one of his books. Then read another. "Even the bad ones were good, and the good ones were astonishing."